Bob, Corinne, and Tim prowl the dark alleys of Gotham to take on the cultural phenomenon that was Tim Burton's Batman from 1989. We discuss the controversial casting of Michael Keaton as the Caped Crusader, compare the movie's depiction of the Dark Knight to his other TV and film appearances, and ponder the Batmobile-sized plot holes in its screenplay. Warning: Contains explicit language, spoilers, and speculation on the potential crime-fighting career of the Mooseman! You ever tango with Satan bathed in lunar illumination? Do you think the Keaton Batcave is the lesser for lacking a giant penny? Want to speculate on what Alexander Knox's legal fees for the inevitable sexual harassment litigation would amount to? Leave a comment and keep the discussion going. 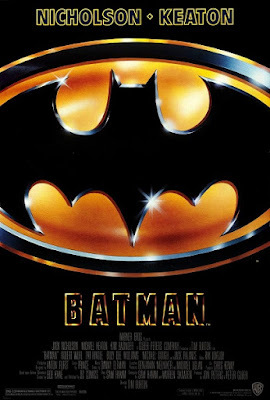 I honestly haven't watched any of this run of Batman films since the 90s. Despite getting swept up in the declining pop culture sweep of their releases as I bought the toys and video games and saw them all in theaters, I never forged a deep attachment to any of them. I keep meaning to revisit the lot, though. Even the Schumachers. I remember liking Forever before &Robin retroactive dragged it down. Returns was probably my favorite because, even as a kid, I quickly became a fan of Burton's style and that's much more a pure Burton film that just happens to have Batman than it is an actual Batman movie, which isn't a bad thing but I can understand how alienating it is to other fans. This first Batman is the one I'm probably the most distant from, so won't comment. But holy hell that theme march. Talk about something that sticks with a person for life. You might be interested (plug plug) in this piece I wrote on Tom Mankiewicz's original Batman script which was discarded when Burton came on board. I've also read Sam Hamm's draft. It's been a while, but I do remember it being much cleaner plot wise than what you describe here. His Batman Returns was also a great script, but was almost entirely discarded, with Dan Waters (one of my favorite writers) doing a full page one rewrite.